Parents of younger children often wish they had some additional, separate play space for their kids. But who has room in their house for a room dedicated to play? One great thing about remodeling your home is that—if it’s done right—it can help you maximize the space you already have. 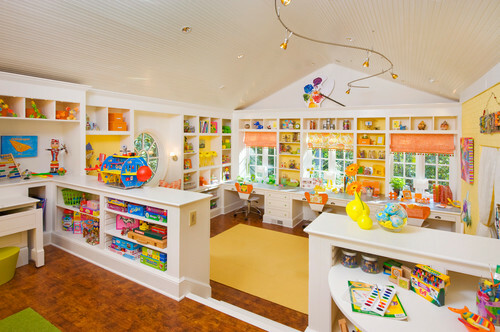 Let’s look at some really creative ideas for incorporating a playroom into your Sycamore remodel. These ideas aren’t just fun and inviting, but they also allow you to tap unused (or underused) space in your home. Sports are a great way for kids to entertain themselves and blow off steam. But the weather around Sycamore (especially in the winter) doesn’t always cooperate. The “sports field room” you see here let’s kids play soccer, basketball, dodge ball, or tag in a safe environment. You’ll notice that even the walls are padded so kids can go full tilt without getting hurt. It also dampens the noise. There’s even a bonus room with pinball machines that could also be a used for watching videos or gaming. 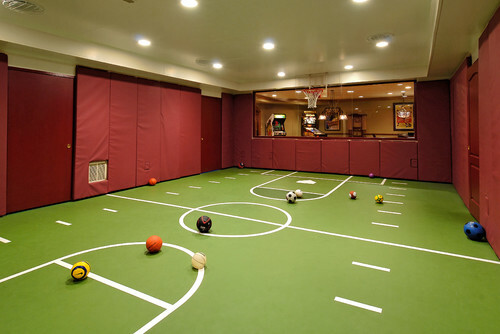 What a great way to take advantage of unused space in your basement. If you want to give your kids a chance to unleash their inner artist, here’s an idea that let’s them do that in a space where they can be creative and you don’t have to clean up each time guests come over. Your home may have an attic that’s not really tall enough for adults, but will be more than adequate for younger children. Built in storage shelves provide lots of space for art supplies. You can also add plenty of ceiling lights to keep the room bright. For flooring, you can pick from a number of easy-to-clean materials so you don’t have to worry about spills. And while you could create a similar space elsewhere, it’s a great use of what otherwise might be space that just collects clutter. Also, the peaked ceiling is a nice, fun touch. Kids are always looking for small spaces where they can hide away for a little “alone time”. Making a fort or a tent in the family room is great fun, but it always has to be taken down when guests come over (or when the dog knocks things over). Here is a fantastic, fun-sized room that offers a great alternative. A staircase with unused space underneath it could be an ideal space for a hideaway. It doesn’t need to be big. Just add some lights, a few outlets, flooring, and some fun, kid-sized furniture. Harry Potter never had it so good! These are just a few ideas for turning unused space into something really special. Where is the underused space in your Sycamore home? It might be just the space you need for a fun and safe playroom for your kids. We’d love to help you come up with a solution that meets your specific needs and will delight your kids.